Typical Tank setup: A well planted aquarium with rock work and driftwood / bogwood. Plants will give the weaker individuals a place to hide, until the pecking order of the school is established. Compatibility: This fish needs to be kept in schools. The larger the school the better with 9 fish a good minimum amount. If kept in smaller schools the weaker individuals will be harassed continuously by the more aggressive individuals until they die. 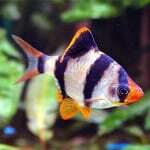 Green Tiger Barbs have a tendency to nip the fins of slow fish and ones that have long flowing fins. The way to combat this is to keep them in a large enough school. If this is done, they will generally keep themselves busy within the school and usually not bother their tankmates too much. If kept with smaller fish, they too should be kept in a school. 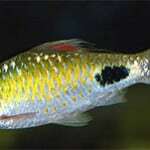 Sexing: Sexing Green Tiger Barbs is not very hard, since the female Green Tiger Barb is larger than the male and sports a rounder belly. 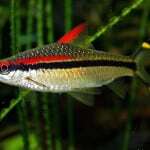 The male have a distinctive red nose, and above the black part of his dorsal fin you can see a characteristic red line. 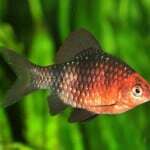 The dorsal fin of the female is mainly black. 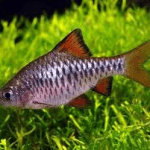 Breeding: If you want to breed freshwater Green Tiger Barbs in captivity, the best method is to keep a shoal of Green Tiger Barbs together and let them form their own pairs. 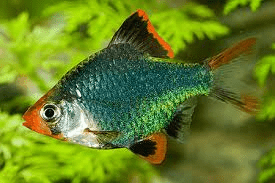 It a good idea to use a well planted aquarium since Green Tiger Barbs eat their own eggs, as well as eggs laid by other fishes. 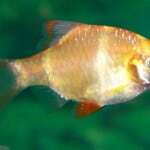 Removing the adult fish after spawning is therefore recommended. 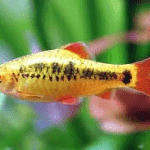 Additional Information: Varieties include the normal tiger coloration, but green, black, gold, and albino Tiger Barbs with regular and long fins are also available. The average life- span in a well kept aquarium is 6 years.